As you'd expect, Refrigerant is a commonly used part. It's been used by YourMechanic in thousands of appointments. On average, these jobs have been completed with a rating of 4.8 out of 5. This part is required for many services, including: Car AC Compressor Replacement AC Condenser Replacement, Car AC Low Pressure Hose Replacement and others, which are listed in the services section below. An AC system has many components: compressor, condenser, receiver dryer, evaporator, and hoses. The compressor, the “heart” of the car’s air conditioning system works like a pump taking refrigerant, (R-12 in older cars, R-134a in 1995 and newer cars) and pressurizing it, passing it along to the evaporator. The AC compressor has several moving parts (including pistons and valves). These internal parts can fail, causing the AC compressor to stop working. It is common for the internal parts of the compressor to come apart and disperse metallic debris throughout the system. Consequently, it is a requirement to replace the orifice tube and the receiver dryer when replacing the compressor since some of the debris may have ended up there. For an AC compressor to work, it needs a clutch, bearing, and an electrical connector. The clutch is driven by a drive/serpentine belt, which engages the compressor when you switch on the AC. The clutch can burn or the bearing can fail. If the bearing or clutch have failed, it is recommended that the compressor be replaced. Sometimes replacing the entire compressor with a remanufactured one can be cheaper than replacing an individual clutch or bearings. It is also common for the seals in the AC compressor to go bad. The compressor may start leaking refrigerant and/or the AC oil. If the seals no longer hold, you will need a new compressor, as the seals cannot be replaced. A compressor may also fail if there is sludge or debris in the air conditioning system. If there is sludge or debris, the hoses, evaporator, and condenser should be flushed to get rid of the contaminants. When it is not possible to flush the parts, you may need to replace those parts. The AC system has many key components: compressor, condenser, receiver dryer, evaporator, and hoses. For an AC system to work, it needs a gas or liquid substance called refrigerant (R-12 in older cars, R-134a in 1995 and newer cars). The job of an AC condenser is to convert the AC gas into a liquid form by cooling it. There are two common causes of condenser failure. The first scenario occurs when the condenser starts leaking. The condenser has tubes and seals, both of which can leak with normal wear and tear. Since there is no way to replace these tubes and seals, you will need a new condenser. Keep in mind this can also be caused by physical damage as the condenser is mounted near the front of the car and as such is susceptible to rocks or other road debris. In the second scenario, the condenser is unable to circulate the refrigerant due to metallic debris blockage. This debris is often the result of a failing or defective AC compressor where internal parts of the compressor come apart and disperse metallic debris throughout the system. If this is the case, you will not only need a new condenser, but also a new AC compressor, orifice tubes, and receiver dryer. When the AC condenser is replaced, the compressor, orifice tubes, and receiver dryer often have to be replaced as well. Any refrigerant that has not leaked out will need to be vacuumed out. What common symptoms indicate you may need to replace the AC Condenser? Air conditioning is not as cold as it should be. Air conditioning does not work at all. Install an AC gauge set to measure the pressure. Inspect the condenser for leaks. If condenser is bad, remove all of the refrigerant. Evac and recharge the AC system. Check for proper operation of the AC system. The AC system has many components: compressor, condenser, receiver dryer, evaporator, and hoses. For an AC system to work, it needs a gas or liquid substance, a refrigerant, (R-12 in older cars, R-134a in 1995 and newer cars). Hoses carry the refrigerant throughout the AC system. A car usually has four or more hoses. The AC system hoses are connected to the evaporator, condenser, dryer, and the compressor. Due to normal wear and tear, the hoses can crack and leak refrigerant. Because the cracks cannot be sealed, you will need new hoses. 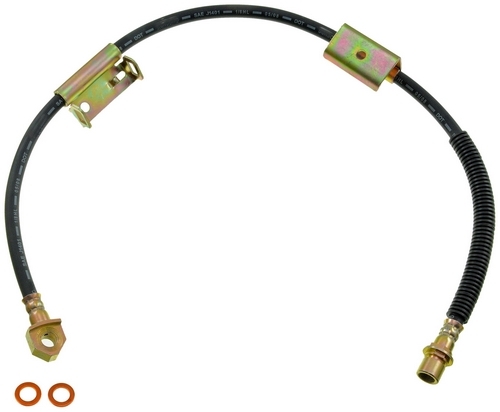 What common symptoms indicate you may need to replace the AC Low Pressure Hose? Use the manifold gauge set to measure the pressures. Inspect the AC system for leaks. Remove refrigerant from the system. If an AC hose is leaking, remove and replace the hose(s). Check the car for system leaks. The air conditioning system in your vehicle depends on the refrigerant that circulates in the A/C system. In particular, the evaporator core inside the passenger compartment requires a specific, metered amount of refrigerant in order to efficiently cool the interior. The expansion valve, also known as an orifice tube in some designs, regulates the pressure of refrigerant that enters the evaporator. The tube is also where liquid refrigerant under pressure converts to a gaseous form. The gaseous refrigerant absorbs heat from air passing through the evaporator core and carries it to the condenser where the heat is removed. In a situation where the orifice tube is either blocked or stuck open, the air conditioning will not cool properly. Too much refrigerant will cause frost on the core and prevent air from passing through to cool the air temperature. Too little refrigerant passing through the evaporator means not enough heat is absorbed and the interior is insufficiently cooled. In either situation, you may need to replace the expansion valve/orifice tube. Air conditioning work needs to be completed by a trained and licensed professional in nearly all circumstances because refrigerants are regulated substances. It is possible for the expansion valve to become blocked by excessive moisture in the air conditioning system, which would indicate a receiver/drier problem. What common symptoms indicate you may need to replace the Expansion Valve (Orifice Tube)? There are two sides to your car’s air conditioning system – the high pressure side and the low pressure side. Both sides are connected to the compressor, and both sides have pressure switches that act as safeties if something goes wrong. In the event of a pressure-related issue on the high side, the AC high pressure switch trips, which effectively turns off the system. This is supposed to help prevent damage to other components. There are many different conditions that can mimic AC high pressure switch failure or tripping, and it requires an experienced automotive mechanic to determine the underlying cause. If the high pressure switch does trip, the system will not work until the problem has been rectified, or the switch replaced if it is faulty. AC high pressure switches are generally not inspected even during AC system maintenance unless there’s a problem. AC high pressure switch and low pressure switch replacement should only be undertaken by an experienced mechanic with automotive HVAC system training. What common symptoms indicate you may need to replace the AC High Pressure Switch? Your car’s air conditioning system uses a refrigerant that takes on different characteristics at different pressures. Under low pressure, the refrigerant is a gas. Under high pressure, it’s a liquid. This means there are technically two “sides” to the AC system – the high pressure side and the low pressure side. Both sides must monitor pressure to ensure safe operation. One of the safety features built into modern air conditioning systems is a pressure switch – the AC low pressure switch is designed to trip if there’s a pressure-related issue on the low side, and the high pressure switch on the high side. The AC pressure switch basically turns a side of the system off if certain events take place. There are numerous causes of low or high pressure switch tripping, and not all of them involve switch failure. A low refrigerant charge can cause the low pressure switch to read incorrectly. The same goes for a high refrigerant charge. AC pressure switch operation is generally not checked unless there is a problem. Many different problems can cause symptoms consistent with pressure switch failure. What common symptoms indicate you may need to replace the AC Pressure Switch? What are the common symptoms indicating you need a AC Recharge? A top-rated mobile mechanic will come to your home or office to determine the source and cause of the AC malfunction. After the inspection, the mechanic will provide a detailed report that describes the air conditioning issue, along with the scope and cost of the necessary repairs. The mechanic will perform a visual inspection of the air conditioning system, check the refrigerant for the proper charge, use a sniffer to identify any leaks of CFC gas, test the heater controls to make sure the air is being directed across the evaporator and sealing off the heater core, and then check other system components as specific symptoms and issues are identified. I was very skeptical about this service, being a first time customer. But, Peter put me at ease when he started explaining what he would be doing. He was extremely professional and very knowledgable. And, the price was the same as my quote. This rarely happens at auto repair shops. I am extremely satisfied with his work in the hot Arizona sun. My AC now works like new! Thanks Peter! On time...very knowledgeable & professional....did a great job. Will use Allen whenever my vehicles need servicing in the future! Highly knowledgeable and a wealth of information. Q: Add refrigerant to a/c unit, how much$$.